Tharith lives with his parents and a brother. This family lives in a small house which built from zinc roof, and cover with leaves palm wall. Her mother is a garment worker and earns USD 130 a month. His father is a construction worker and earn USD 6 a month. The family lives in a difficult situation, lacking of foods, rice and money to support their children. Therefore, Tharith needs sponsorship in order to support his education. His physical and mental health has fine upon enrollment. He does not sanitize and dress well. 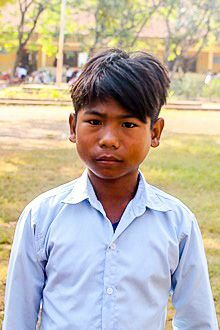 Tharith was introduced into our program by the office of Commune Committee for Women and Children (CCWC) because his family is one of the poor families in the communities. Tell your friends Tharith needs a sponsor!